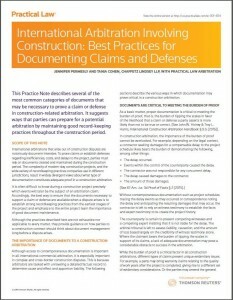 The article discusses the type of documentation that may be relied upon in international arbitrations involving complex construction disputes, and provides an overview of best practices for maintaining documentation during the construction project. This article is also available in Spanish and Portuguese. Jennifer Permesly, Partner, specializes in international arbitration and U.S.-based litigation for international clients. She regularly acts as counsel to owners, contractors and related parties in international arbitrations involving construction disputes. Tania Cohen, Associate, represents corporate clients in arbitration and general commercial litigation, and has acted as counsel in several high-profile construction arbitrations. October 2015 – A day before the 2015 TCS New York City Marathon, thousands of runners took to the streets of Manhattan for the New York Road Runners’ Dash to the Finish Line 5K. Chaffetz Lindsey attorneys (from left to right in the photo below) Meredith Craven, Gretta Walters, Tania Cohen, Stephanie Sado, Aníbal Sabater and Justinian Doreste took to the pavement to prove that our lawyers are more than just sharp legal minds, they are fierce athletes as well! For more information about the NYRR event, click here. Congratulations to all the runners who competed!